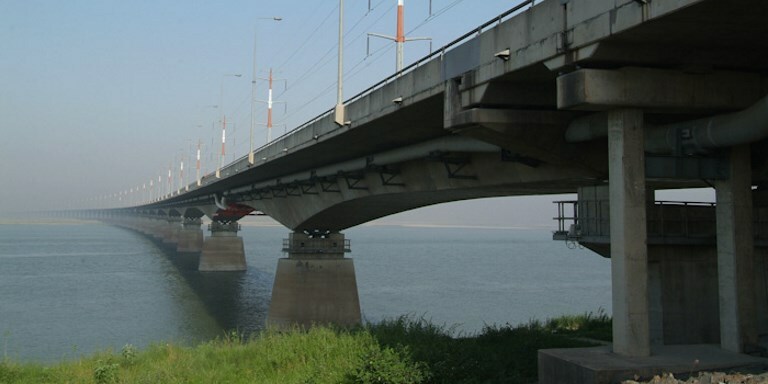 The 4.8-kilometer bridge over the Jamuna River has brought together millions of people in Bangladesh. Photo credit: ADB. The bridge over the Jamuna River in Bangladesh is a national landmark, but it is also a symbol of the country’s remarkable progress in the last four decades. Bangladesh was once divided by one of the world’s largest rivers. The Jamuna River was a physical barrier between the more developed eastern half of the country and the poorer but agriculturally rich west. The eastern side of the Jamuna River has access to the capital city of Dhaka and to international markets through the port of Chittagong. The western half has fertile agricultural areas that could become the food basket of the country and an important source of international exports. Bringing agricultural products from the west to the ports and markets in the east was a monumental task. The Jamuna River had to be crossed using crowded ferries and small boats. Long delays waiting on one side of the river or the other were common for both people and freight, and in the monsoon season, the journey could be deadly. Spanning the shifting course of this deep, wide, fast-flowing river with a permanent structure would be one of the most technically challenging transport projects ever attempted in Bangladesh, but by June 1998, the Jamuna Bridge Project had succeeded in uniting east and west. The $754 million project was supported by the Asian Development Bank together with other partners. Since its opening, the 4.8-kilometer Bangabandhu Multipurpose Bridge on the Jamuna River has brought together millions of people in Bangladesh and also served as a basis for the transmission of electricity, natural gas, and phone lines between the two halves of the country. The bridge over Jamuna River was a milestone for Bangladesh as a country, but it was just one of hundreds of projects and programs that ADB has supported over more than 40 years since the partnership began. ADB began working with Bangladesh in June 1973, shortly after the country gained independence. Work was initially focused on food production, transport and energy infrastructure development, and promoting industry. By the mid-1970s, ADB had approved loans to strengthen Bangladesh’s power sector, the port of Chittagong, and the Bangladesh Railway, and to improve the Khulna–Mongla Road. In 1978, Bangladesh received ADB’s first program loan—a new type of assistance that initially focused on financing the importation of production inputs to increase productivity in priority sectors such as agriculture. The program helped small-scale farmers in the Dhaka area repair and maintain irrigation pumps. It also financed the purchase of 2,500 new pumps to replace those beyond repair. This enabled farmers to irrigate an additional 40,000 hectares of land during the dry season. ADB undertook a project that same year to improve the country’s education system, and in 1980, ADB began working in the health sector with a project that increased the supply of essential drugs and reduced the incidence of malaria. ADB’s first urban infrastructure loan, the District Towns Bangladesh Water Supply Project, approved in 1982, helped bring down the high rates of waterborne diseases due to unsafe water supply and poor sanitation. In that year, ADB’s first resident mission opened its doors in Dhaka. During the 1990s, ADB approved its first project exclusively targeting women for poverty alleviation,which provided microloans to poor rural women to set up nonfarm enterprises. ADB also embarked on one of its first disaster response efforts following the 1991 cyclone, with $36 million spent on reconstructing roads in the devastated areas. Disaster risk management became a major focus during this period. Since 2000, ADB has further enhanced its assistance to the Bangladesh power and transport sectors, and increased resources for urban and rural infrastructure and water resources management, primary and secondary education, urban primary health care, and small and medium-sized enterprise development. Bangladesh has made substantial progress in growing its economy, lifting people out of poverty, and improving the lives of its people. Employment has increased, more people have access to health and education, and basic infrastructure has improved. Since the mid-1990s, economic growth in Bangladesh has averaged 5.7% per year, reaching a high of 7.1% in 2016. Few developing countries have been able to maintain these levels of growth consistently over such a long period. Average incomes have grown. Since the mid-2000s, per capita gross domestic product has increased by 4%–6% per year. Bangladesh is now working to reach upper-middle-income country status by 2021—the year that marks the 50th anniversary of Bangladesh’s independence. The country will need to tackle many challenges, but Bangladesh has shown that there is no river that it cannot cross to achieve its goals. Jyotsana Varma works in ADB’s country team in Bangladesh. In her 8 years at the ADB, she has previously worked in the Southeast Asia department and the corporate secretariat. Before joining ADB, she served in the Government of India for 17 years in various assignments, both at the policy and implementation levels.